Next, check the fields you’ve selected in the order in which they appear. (i.e. I choose Date first, Memo second, Debit third, and Credit last). I check “Separate Debit/Credit”, since my bank statements have separate columns for debits and credits. These options will all be saved the next time you run XL2QIF. 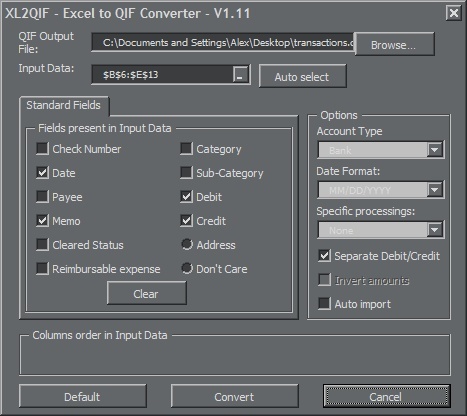 Choose an output file and click convert to save your transactions to a QIF file. Together with your cash account, you should now be able to track almost all of your spending with Wesabe. Be sure to mark your cash withdrawals as transfers so you don’t double-count your spent cash. 1 European CSV (Comma Separated Value) files are separated with semicolons, not commas. My current workaround for this is to rename the CSV file to a txt file, open the txt file in excel, and then change the delimiter to semicolon in the Text Import Wizard.